In Malagasy, "indri" means "look up". A French naturalist Pierre Sonnerat was misunderstood the aboriginal who pointed out the lemur and said "indri". Pierre Sonnerat thought it should be the name and used it to describe the lemur. 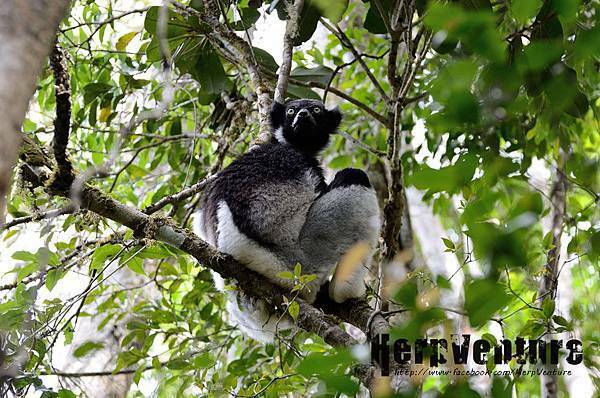 The Indri (Indri indri) is the biggest living lemur on the world. But compare with their extinct relative: a giant lemur big like a gorilla, with a weight about 200 kg, the Indris are pretty small.... they are even smaller than a dog! But now the population number of Indri is also sadly poor. Last year, the scientists estimated the number about 246 individuals, it's smaller than the number of the Angonoka Tortoise (Astrochelys yniphora) and the Giant Panda (Ailuropoda melanoleuca)! If we want to protect Indris, the most important thing is to protect the forest they inhabited in. Andasibe NP is the last place with forest Indris can live in... Go Indris!